Classic VW Cabriolet surf beach cruiser auto biography. Story includes history, facts, and information about VW Volkswagen ragtop surfing convertible. VW Cabriolet Nostalgic Surf Beach Cruiser Volkswagen Bug Beetle Story. The ceaseless rhythm of the pounding waves seemed as though it would never end. For days now the cold, gray and very unfriendly Atlantic had slowly carried me farther and farther westward from my Wolfsburg, Germany birthplace. It was 1952 and only the fourth year Volkswagens were exported to the United States. Over 100,000 Beetles were built in 1952 -- and while over 35,000 of those were for export around the world, only about 800 would find a home in America. The lack of interest was readily understandable. We were small, certainly not powerful, and hardly competition for Detroit's dramatic new post-war styling. It was hard to imagine anyone getting excited about our tiny 69 cubic inch engine with all of its 30 horsepower, especially as America's Big Three auto makers were introducing the first of their powerful new overhead V-8 engines. After docking in New York I immediately found myself on a semi-trailer transport truck with three of my fellow "bugs". We were headed west cross-country destined for Southern California. A new Volkswagen dealership was opening and I was one of four Beetles that would comprise the new dealer's initial inventory. Everywhere along the way Americans stared -- many with a blank look of confusion and others with an expression of utter disbelief. More than a few laughed and there was little doubt that we were an oddity. Our group of four was comprised of two standard Beetles ($1395), one deluxe model ($1595) and myself. The only convertible, I carried the astronomical price tag of $2395. It defied all logic that I actually cost a few dollars more than a new full-sized Chevy Bel Air or Ford Sunliner convertible! I was an unknown quantity. Besides my unconventional looks and high price tag, I faced another stigma. In 1952 America was again at war -- this time in Korea. Anti-German sentiment from World War II was still widespread. Given all this, I envisioned old age setting in before I would ever leave the dealer's car lot. Who would ever pay so much for so little? "Please, Daddy, I've just got to have it. It's so cute!" On the dealer's lot less than a week, I was now on the way to my first home. Thank goodness for little girls with rich Daddies! Despite the fact her father was wealthy, I found my new owner to be genuinely down-to-earth. Vicki was a student at UCLA and my life soon became one of happily transporting her back and forth to campus each day. Although Volkswagens were still very much an oddity in the eyes of most, I did seem to fit in among the "academics" of the early fifties. The beatniks and the hippie flower children were yet to come. However I think it's safe to say that most early Beetle owners were people who enjoyed being different and who thought of themselves as progressive. If you were concerned about the opinion of others, it was a certainty that you did not park a "bug" in your driveway. Weekends were always a special treat. Vicki just loved the beach and Malibu immediately became our second home. Although she was not a surfer, we both enjoyed the warm sun, soft sand and endless breaking waves. After each visit to the beach Vicki lovingly scrubbed all traces of salt residue from my shiny yellow skin. The beach was lined with rusty banged-up old cars, which I swore I would never become -- or so I thought! The fifties passed quickly as I enjoyed the good life. America was again at peace and times were prosperous. Even we Volkswagens were catching on, and with each year I was becoming more and more accepted by the mainstream. As the fifties drew to a close my happy world was shattered. Vicki fell head over heels for a well-to-do businessman in his late forties. He drove the all-time bad-taste ultimate chrome monstrosity -- a 1958 Buick Limited. He despised my very existence. The next thing I knew he bought Vicki a new 1959 Chevy Impala hardtop, complete with its out-of-this-world gull-wing tail fins. The tears that surrounded our parting would easily have filled any ocean, including the vast Blue Pacific that we had enjoyed together for so many years. With the dawn of the new decade I found myself headed back to the East Coast. My new owner turned out to be a three-star General assigned to Army Intelligence. I served as a daily-driver work car traveling between our Maryland home and the Pentagon. I sometimes felt out of place as I certainly wasn't a General's typical car. But my owner admired my mechanical simplicity and took great care of me. I think I was his statement of individualism. In October of 1962 the CIA learned the Soviet Union was building missile installations in Cuba. Intimately involved, my General regularly briefed the Administration. Late one evening, as the crisis deepened, I unexpectedly found myself being driven onto the grounds of the White House. Slumped down in my front passenger seat, face hidden by trench coat lapels and a broad-brim hat, was America's top Soviet counterspy. With lights dimmed and with great stealth, we silently slipped into the White House service entrance. Secret Service agents immediately surrounded us. Then with no warning President Kennedy emerged from the shadows. "Thank you for coming," he said. The President leaned against my left rear fender as he and my unnamed passenger discussed at length Premier Khrushchev's probable response to a naval blockade of Cuba. The President listened intently and asked many penetrating questions. After about a half-hour the President removed his weight from my fender, stood straight, smiled and said, "Cute car, General." He paused for what seemed an interminable time as the smile faded and his expression turned intensely serious. In a soft but firm tone he added, "I've made my decision." As quickly as he had emerged the President vanished back into the shadows -- and my General, our passenger and myself were off into the anonymity of the night. Needless to say neither my General nor I slept much that night. The following day President Kennedy announced implementation of the Cuban Blockade. The world held its breath, but I had seen my President carefully and confidently make his decision. In my heart I was certain all would be well. In 1967 my General received orders overseas and I was sold to an aspiring young actress named Shelly. We were soon headed west where Shelly quickly became lost among the thousands of other anonymous movie star wannabe's drawn like a magnet to Hollywood. "Say, would you like to sell that Volkswagen?" The voice belonged to a well know movie producer who had spotted Shelly and myself parked at a drive-in restaurant. "I'm serious, Miss," he continued. "I'm producing a comedy script, the real star of which is a VW bug that gets involved in all kinds of adventures. Your car will be a star!" Shelly's response was quick. "I'll rent you my car for as long as you need it, but I wouldn't think of selling it." And so it appeared that I and not Shelly was destined for immortality on the silver screen. Rehearsing with all the actors and actresses was so exciting, although I wished Shelly could also be in the movie. "This movie is a sure-fire hit!" triumphed the producer. "You are going to be the most famous bug in the world." I relished the stardom that lay just ahead. The first day of filming was a dream come true. I was hobnobbing with the movie's stars -- Buddy Hackett was my favorite. And then in an instant, my world collapsed. "Sorry, but after looking at the first rushes the studio executives have decided we should use a hard top sedan rather than a convertible," the producer told Shelly. "But we still want to use your car for rehearsals." And so parked off-camera I would watch as "Herbie" took center stage and the cameras rolled. I felt as though I had been robbed, although the pain was eased by Shelly's compassion. "Don’t take it too hard," she said. "That Herbie is just another pretty face. He's not half the car you are." Time passed and then one day Shelly too met the man of her dreams. Just as with Vicki all those years before, her suitor did not welcome me as a part of their relationship. I had met a President, almost been a movie star -- and now I was sitting anonymously in a used car lot wondering what the next chapter of my life might hold. For over twenty years I had enjoyed a very pampered existence. Now however what seemed like the inevitable decline that comes with age was beginning to set in. I suffered through a series of "short relationships" with some very forgettable and non-caring owners. For a while I was a run-around car for a mechanic in Mobile. Every type of greasy tool imaginable was tossed in me. What remained of my stained and tattered rear seat soon acquired an added coat of oil, grease and grime. I didn't think anything could be worse than those grimy tools, but I was to be proven wrong. A couple years later I found myself being used as a weekend fishing car by a very scroungy gentleman in Corpus Christi. Rather than place the fish he caught in a bucket or some other type of container, he simply threw the fish on my back seat. It was more than any car should have to endure. I often thought of how I had come within a hairsbreadth of stardom and wantonly wondered what life as Herbie might have been like. So near then, so far now. It was while serving as a runabout car at a ski lodge in Idaho that I experienced the single worst moment of my life. One day without warning a pickup truck carelessly backed into my left rear fender, demolishing it beyond repair. The lodge owner was upset and soon found a replacement fender at a junkyard. "Here you go," he said. "I care what you look like and I don't want you to have to wear that ugly smashed fender. I know this new one is only primed and doesn't match, but one of these days I'll paint it yellow for you. In the meantime you'll look a lot better than you do now." I gasped in despair. "Oh please no," my heart pleaded. As they tore off the crumpled remnant of my original fender I cried out in anguish, "If only you knew that the President of the United States rested against that fender and stared nuclear war in the face. If only I could tell you!" Ironically, replacing my fender was the first really caring gesture I had been shown in years, although the lodge owner never did repaint it yellow. And yet it was an act of kindness that broke my heart. From mountains to barren desert, my travels and the ever-downward spiral of my life continued. I now was a carryall for a cotton farmer in southern Arizona. Years of pure drudgery passed uneventfully. I had only my memories for consolation. Then one forgetful day in the Sonoran Desert south of Tucson my tired, worn and badly neglected engine could go on no longer. I was abandoned where I stopped, along side a remote trail with only a lone saguaro cactus for company. Searing daytime temperatures reached 120 degrees only to be followed by bone-chilling frigid nights. For weeks at a time I would not see one soul. My companions were the denizens of the desert -- coyotes, rattlesnakes, Gila monsters and a host of nocturnal creatures who shared my hellish, yet magnificent desolation. The desert silence induced a comatose-like trance. I was oblivious to all around. "This is it." I was awakened from my slumber by the sound of a young man's voice. "Looks like it's been here forever. We'll just pump some air in the tires and tow it away." I drifted in and out of consciousness, but I realized I was not dreaming when I felt my long flat tires being inflated and a rope being attached to my front bumper. Slowly I moved for the first time in a decade. I was overcome with emotion as I bid my only friend, that lone saguaro cactus, a sad goodbye and watched as my faithful compatriot vanished into the desert horizon. "It definitely needs a new engine, Eric. What are you going to do with it when you get it running?" Eric was a quiet young man with a gentle touch. As he turned his wrench he replied, "Oh, I think I'll give it to my sister Jennifer. Our grandmother used to have a car like this and Jennifer thinks it would be a neat car to cruise around in. 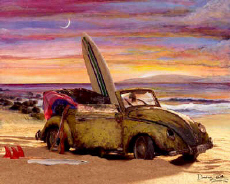 She's a surfer and driving a beat up, dilapidated old Cruiser is what she and her surfer friends seem to want." My heart raced at the thought of again going to the beach, just as I had with Vicki so many years before. And if I was hearing correctly, the more rust and dings I sported the more "in" I was going to be. Life certainly is filled with bizarre twists. And so for the third time in my life I was again headed for California and my new home with Jennifer. Although Eric had restored my mechanical condition to good working order, my outer body appearance was definitely not good. I understood why Jennifer parked me a block away from the upscale jewelry shop she worked in. Always elegantly dressed for work, on Friday afternoons Jennifer underwent a complete metamorphosis as we headed off for our weekend at the beach. Often we went to Malibu just as I had with Vicki so many years before. I couldn't believe I had been given yet another chance at life. "Neat car, Jen!" I was the envy of all her friends. "Wish I had a brother who would find me a Cruiser like that. Your Cruiser's really got character. Look at all the dents and corrosion. Those have gotta be the scars of one fascinating life." Yes, I'll definitely second that! "I hope you don't get seasick, my friend, because we are moving to Maui!" Jennifer patted my hood as she spoke those magical words. Maui is every Cruiser's dream and I was ecstatic. But seasick? I'm sure she didn't even realize that I had traveled the cold and perilous Atlantic long before she was born. "My grandmother lives on Maui and she's gotten me a job in Lahaina," Jennifer continued. "From now on it's the surf and lots of 'Maui Magic' for us." Within days I was driven to the ship that would carry me ever farther westward to a new life -- a life half a world and nearly half a century away from Wolfsburg. That first journey had been marked by nervous anticipation. This voyage would be one of pure carefree bliss. Two weeks later I watched as Haleakala, Maui's 10,000-foot volcanic mountain, appeared on the horizon. Docking at Kahului Harbor I was filled with nostalgia as I thought back to the long-ago day I had arrived in New York Harbor. Then I spotted Jennifer waiting on the wharf. Standing beside her was a much older woman I was sure was her grandmother. However my joyous rendezvous with Jennifer was about to be upstaged by the biggest surprise of my life. You take my car, dear. I want to drive the bug. I used to have one just like this when I was young." As the old woman slid behind my wheel she gently whispered, "It's you, isn't it?" I couldn't speak -- my heart was all aglow. "They call me Grandma Vic now," she continued. "I should have never sold you. I've regretted it all my life." As we slowly drove away from the harbor I was still in shock. Grandma Vic, my Vicki, then proceeded to make it clear that we would never again be parted. "You and Jennifer will have a great time at the beach," she said. "Maui has the greatest surfing in the world. But someday when Jennifer in a moment of youthful foolishness decides to sell you, I'll be there. I promise I will never leave you again." The tears that flowed during our drive home surely surpassed even those we had shed at our parting nearly four decades earlier. Life on Maui is simply Heaven on Earth. Kapalua to Kaanapali to Lahaina to Wailea to Makena, there isn't a beach Jennifer and I haven't visited a hundred times. But the windward side of the island is our favorite, especially Hookipa Beach. Just outside the old plantation town of Paia, Hookipa has some of the finest waves to be found on the planet. Jennifer has made lots of friends and I enjoy hanging out with the other Cruisers. But best of all is when Grandma Vic rides along with us. As Jennifer surfs Grandma Vic and I just sit quietly together and enjoy the most peaceful and serene ecstasy imaginable. "Neat car!" "Way cool!" The comments are never-ending. Occasionally a child will blurt out, "Look, it's Herbie!" Ah yes . . . Herbie. It's funny how I spent so much of my life being jealous of him. I know for a fact that Herbie is now on display in an automotive museum somewhere in the Smokey Mountains -- no doubt in a sterile and climate-controlled environment. Soft sand, golden sun, salty sea breeze, crashing waves rolling in from the vast Blue Pacific -- and most importantly Jennifer and Grandma Vic. I wasn't a star, but my life has been blessed by a lucky star watching over it. Herbie, eat your heart out!